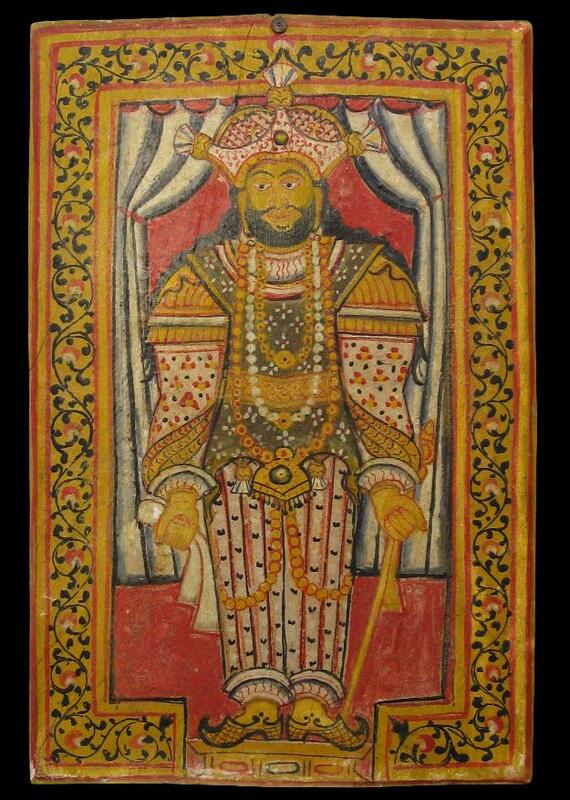 This formal Sinhalese painting in light polychrome oils of Sri Vikrama Raja Simha shows the king wearing a crown surmounted by a boralaya, a shirt (kamisiya), a tunic (bo-hettaya), a cape (mante), trousers (udaya), slippers, earrings, necklaces and pendants. Suspended over his waist is a double-headed bird pendant known as a kurulu bendi malaya. He holds in his left hand as an emblem, a lacquered arrow, and in his right hand, what appears to be a white kerchief. Befitting a king, he stands on a pedestal. 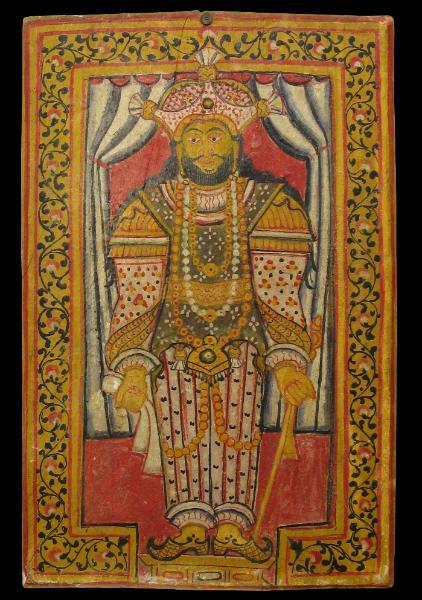 Curtains pulled back are on either side of the king, and the image is contained within a border of scrolling picca mala (jasmine) creepers and flowers. 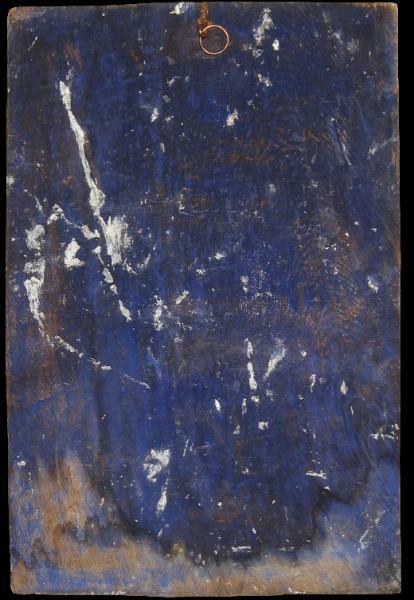 The reverse of the board is coloured a deep blue. A very similar formulation of Sri Vikrama Raja Simha but this time with attendants, is illustrated in Coomaraswamy (1956, plate XXII) with the note that the image is from a Sinhalese painting reproduced in Davy’s Travels in Ceylon. Sri Vikrama Raja Simha’s reign was one of great turbulence. The British gained Ceylon’s Maritime Provinces from the Dutch during his reign. The King had asked the British to help him overthrow the Dutch but ultimately, the British overthrew the King. The British provoked the King into acts of aggression which became the pretext for their seizure of his kingdom. War was declared and in Match 1803, the British entered Kandy with no resistance. A massacre of the British ensued several months later and the King was restored. The King had to contend with a rival clan that wanted to replace him and establish a dynasty of its own. He dismissed the potential usurper and had his wife and children executed. Such executions had become a feature of his reign. The British invaded Kandy again in 1815 and the kingdom was ceded to the British via a treaty known as the Kandy Convention. Sri Vikrama Raja Simha was captured and held in a British fort in southern India. He died in exile in 1832. The capture of Kandy by the British ended 23 centuries of uninterrupted royal rule on Sri Lanka. This painting may be contemporaneous with Sri Vikrama Raja Simha’s rule; it is certainly nineteenth century.